Look at the Sound menu of Windows. You can open it directly of via the control panel. 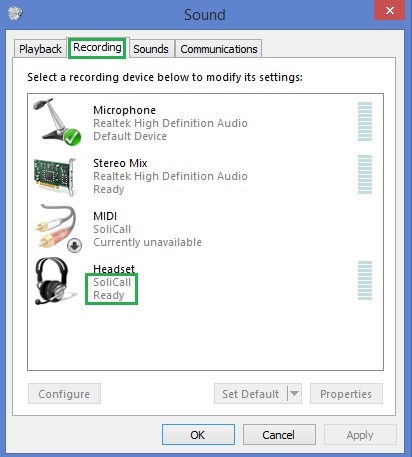 Make sure SoliCall appears in “Ready” state both for playback and recording. NOTE: If you do not see the device “SoliCall”, it means that it was blocked by windows. This might happen if the certificate of our driver was not recognized. The solution is usually to update your windows with the latest security updates. For more information, please consult our FAQ entry “driver not signed message appears“. By default SoliCall will use the “Default Communication Device” of your computer. 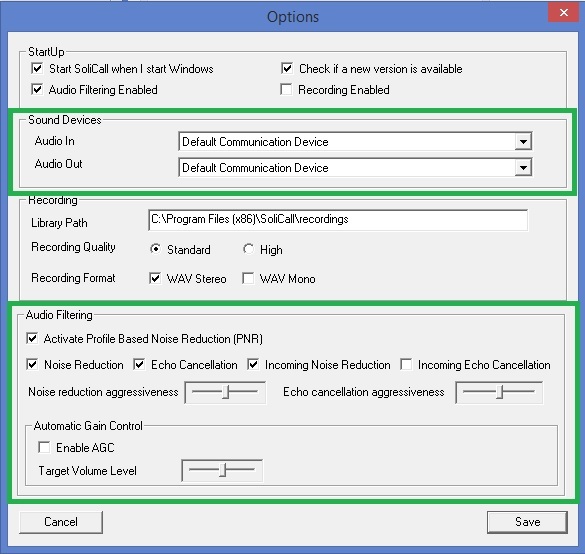 If you do not want SoliCall to use the “Default Communication Device”, go to SoliCall menu “Tools –> Options” and choose a specific sound devices you want SoliCall to use. • PNR – Uses a generic profile to enhance the noise reduction (both for incoming and outgoing audio). • Noise Reduction – Remove ambient noise on your side so your party can hear better. • Echo Cancellation – Cancel echo on your side so your party will not hear himself/herself. If you are using headset you can disable this filter. • Incoming Noise Reduction – Remove ambient noise coming from the far-end so you can hear better. • Incoming Echo Cancellation – Cancel echo coming from the far-end so you will not hear yourself. • The two sliders for noise reduction aggressiveness and echo cancellation aggressiveness control the aggressiveness of the filters. Increase aggressiveness by moving the slider to the right and reduce aggressiveness by moving the slider to the left. • Automatic Gain Control can make sure volume level (of both sides) will be aligned with the target volume level. Enable this feature if either you or your party find it hard to hear each other. Moving the slider to the right will increase the target volume level. 1. 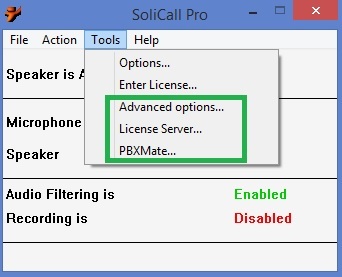 Connect SoliCall Pro to PBXMate in order to perform a powerful centralized noise reduction. This capability is important for environments like call centers and shared work spaces. 2. Activate a stand-alone reference-based noise reduction in order to attenuate background noise like children shouting, TV playing etc. The availability of any of these advanced options depends on your license. To test your configuration, open the main screen of SoliCall and make a call. You should see that both microphone and speaker indicators turn ON. If not, please check again your settings. If you encounter any unexpected behavior like low volume, please consult our FAQ. To set up SoliCall, go to: Settings –> Sound. Set the Microphone, Speakers and Ringer to “SoliCall”. To set up SoliCall, go to: Preferences–> Devices. 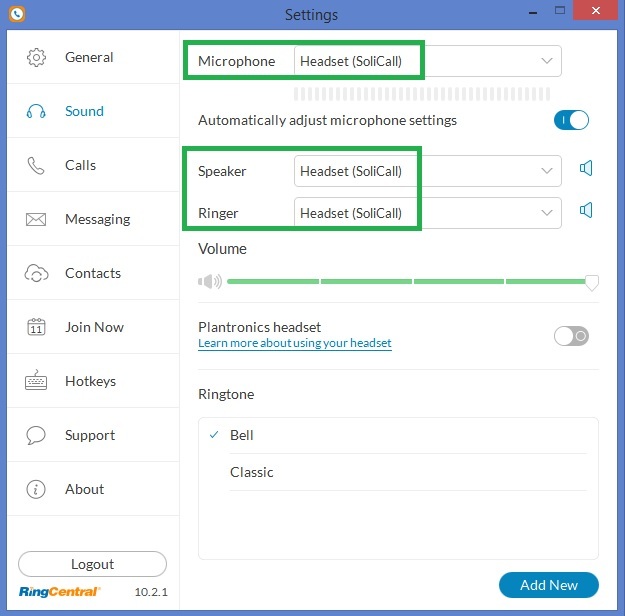 Set the Microphone and the Speakers to “SoliCall”, then click Apply and OK.
To set up SoliCall for other soft-phone programs, go to the program’s main screen, look for the audio settings (usually in settings/tools-options/preferences) and change the Audio In (microphone) and the Audio Out (speakers) to SoliCall. If your soft-phone does not give you the option to change the audio device, it means that it is using the default audio device (or default communication device). 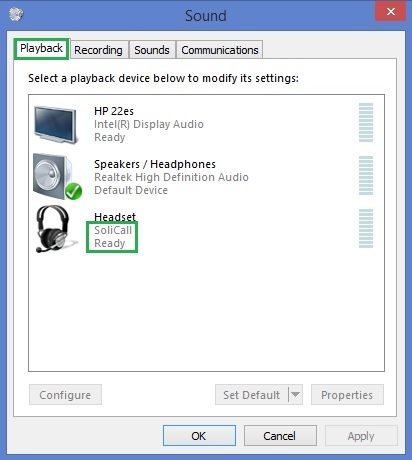 In that case, you will need to change the default audio device (or the default communication device) in Windows to be SoliCall, and in SoliCall you will have to select the specific sound device you would like it to use.